Hi all! Can you believe we're half way through the year already? That means, we're half way to Christmastime.....yikes! I can't hardly believe it. I'm totally in summer mode right now....warm weather, flip flops, trips to the beach, and all that fun stuff....but, I have some brand new JustRite stamps to show you....some Christmas stamps! The set I want to show you today is called Holiday Cheer. I decided to make a little glassine treat bag....there's a yummy chocolate brownie-covered pretzel (store bought) inside. Mmmmmmm....yeah, you KNOW I'm thinking about tearing into it! The snowflake circle is up on foam tape and the edges are sponged with Old Olive ink. I added some Eucalyptus Stickles to the snowflake and the dots around the Merry Christmas sentiment. All the new JustRite Christmas sets are available at Stamper's Dream. 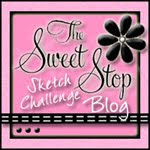 Be sure to stop by Karen and Amy's blogs today because they also have some Christmas projects to share with you. I'll be back tomorrow with a JustRite Christmas card. Such an elegant treat bag, Denise! Love that you embossed the glassine bag!! Fabulous ribbon....need to go order more from Sharon! This is just an awesome project. I LOVE IT. I hope you don't mind, but I would love to do this for the teachers Christmas gifts! I love the idea of embossing your bag! That big fat juicy ribbon is gorgeous on there too. I am going to head to the Justrite site and check all their new stuff....this could be trouble! I LOVE your glassine embossed bag! And the tag you made with those colors is nothing short of AWESOME! Fabulous treat bag...perfect in every way! Love this treat bag, Denise! 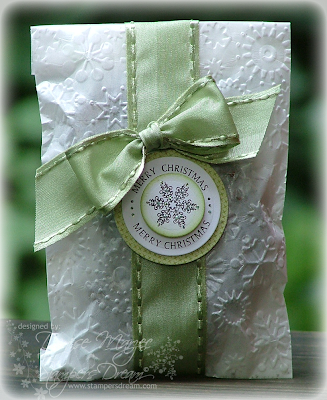 Such elegant packaging with the dry embossing and gorgeous ribbon! This is gorgeous Denise. I love how you did this bag and the colors are so pretty. Fantastic package. I love the embossed bag!!!!! Gorgeous ribbon and medallion too. How beautiful Denise! GORGEOUS packaging in the glassine bag and I LOVE the new JR stamps!! 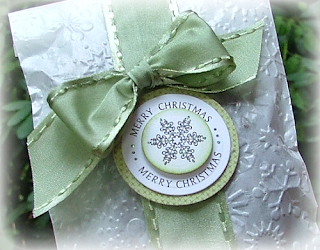 Very pretty with the ribbon and the textured design. Makes for a wonderful treat bag. Such pretty packaging Denise! That ribbon is perfect for this too! So cute as a little tag! Love that snowflake and the beautiful bag. I'm ready for that chocolate-covered pretzel, too! beautiful! I love this bag! I really need to get my hands on some glassine bags and get busy! Thanks for sharing! This is so beautiful Denise. I just love this snowflake, Denise! And that gorgeous soft green ribbon! Love this! This is too pretty to tear into...:) Love the folder you chose for the bag.. That ribbon is beautiful..
Beautiful, Denise! Love how you embossed the bag.. it looks so elegant and sounds yummy!! This is beautiful, Denise! I love the embossed bag! This is so pretty! I love the color green of the bow and that darling bag. What a cute idea & project. I've never seen that paper before, it's really cute! This is SO beautiful! Makes me ALMOST wish it was wintery and white outside, almost -- but NOT quite -- LOL!! Jumpin' on the Twilight bandwagon!